Though something of a transition album, Forever Autumn's latest full-length begins to really define a genuine vision for fully-acoustic Doom. If there's one thing I've learned over the last few years, it's that not everyone is convinced that 'Acoustic Doom' is a thing. Personally, I disagree. It's a rare thing in this neck of the woods, true, despite the quite frequent inclusion of various acoustic instruments within certain strands of the genre. But in the Rock and Metal world it's run the gamut from bands recording with an orchestra in tow (such as Deep Purple, Caravan and, inevitably ELP) to fully orchestral ventures such as the LSO's 'Classic Rock' series begun in the late '70s; and from the 'MTV Unplugged' phenomenon of the '90s to artists like Ed Alleyne-Johnson and Apocalyptica who've made careers out of reinterpreting Metal on strings. All, in their own way, true to their originating genre, and with nary an amplified instrument in sight (perhaps with the exception of Ed, who notably used his own handmade electric violins). You could certainly argue that Doom, with its porous boundaries and combination of Trad and Extreme musical aesthetics, has the potential to be even more fluid and forgiving than genres with more hidebound and distinct technical requirements...but - I'm not here to try and change your mind on that. If you don't think Doom works on any level without a massive stack of Orange amps and a 27 bpm riff loud enough to force both your heartbeat and your breathing to synch with it, give this a swerve. It isn't for you, and we'll both be a lot happier if I don't have to try presenting a case that it should be. So, for anyone still reading, let's assume that you're at least vaguely onboard with the idea that there is a spirit somewhere within the Doom vibe which can be presented in sparse, minimalist, fashion, using traditional and found instruments, acoustic discordance and the modulation of a human voice to convey all of the hopeless and despondent atmospheres that you'd want to embrace. In which case, allow me to introduce you to (or perhaps reacquaint you with) the duo of Autumn Ni Dubhghaill (instruments and vocals) and Jon McGrath (cello), and their complicated mix of Drone, Doom and Folk elements. Not to mention their equally complicated history, which has resulted in 'Howls...' actually being the follow-up to 2014's 'Patience of ðm Fire-Keeper', rather than the chronologically preceding 'Waiting for Öktober MMXVI', which was a remix and partially re-recording of 2008's 'Waiting for Öktober'. As such, it carries more of the characteristics of the former than the latter, eschewing the electric guitar that both the original and re-imagined '...Öktober' brought to the table. 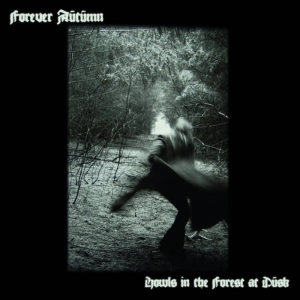 No bad thing, in my book - though the earliest incarnations of Forever Autumn took plenty of inspiration direct from Skepticism, and channelled a lot of that into the early works, their present-day sound more clearly belongs to this band alone. Still, if you've heard either of those previous albums, opening track 'All My Relations' will be familiar territory: lilting acoustic guitar, hand percussion, underpinned by the deep and satisfying drone and vibrancy of cello, female vocals that traverse from clean to croaking, shrieking harshness, melancholy lyrics that mix mythical archetypes, ancient history and present-day shamanism. If you haven't, well it pretty much sets out the stall for the first half of the album: a voyage that touches at least as often on the borders of gloomy Neofolk as those of Doom. In the uptempo moments, and the harsher vocals, it's even possible to hear faint traces of Autumn's Black Metal influences. So far, so logical a progression from '...Fire-Keeper', right down to 'Owl Bones And River Stones' echoing that album's mournful cello-driven 'A Sadness On Winter Leaving' in sound, feel and suitability for being the representative "album single". After that, though, things get a little stranger. Initially, I have to say, not in a good way - though I can understand, and respect, the antecedents of using pipes for traditional dirges and elegies, I still find the tinny sound of pennywhistles (in this case, the feadóg) pretty much unlistenable. Unfortunately, 'The Forest I Know So Well' bookends each of its brief but sublimely intimate whispered verses with a lengthy and repeated section of exactly that. Whilst I'd say it probably hits its valedictory target well enough, it's not really to my taste. On the plus side, it's followed by the two doomiest tracks on the album. The dissonant and compulsive 'Fire In The Head' has more than a shade of Sol about it, mixing strident and in extremis Folk/Death/Doom elements into an authentic whole. And then the follow-up - album closer, 'Mother Vulture' - somehow conjures up a bleakly Doom vision of Cockney Rebel's 'Ritz', albeit one which lyrically reflects authentic pain rather than Steve Harley's artsy rhyming. Obviously, that is nothing short of brilliant, before you ask. So, OK, even if you're happy with the idea of 'Acoustic Doom' in principle, you might wonder if Forever Autumn embody it in the same way that, say, a "Candlemass Unplugged" album might. To that, I'd have to reply no - this is a much more shifting and chimaeric beast than that would ever be. And I would also add that I don't think 'Howls...' is quite the match of either of its predecessors in reaching a distinct and take-it-or-leave-it conclusion about where that particular beast currently stands. In some ways it feels like a transitional release, particularly in the second half. While '...Öktober', with its electric-acoustic roots, had enough "authentic" instrumental backing to create a Doom backdrop and '...Fire-Keeper' had a harder task in standing on a more atmospheric, folksy platform, 'Howls...' finds a way to begin injecting the oppressive heaviness of the former into the purely acoustic instrument set of the latter. Admittedly, that makes it something of a patchier release in and of itself, but I'd view that as the necessary sacrifice for making a significant step forwards. I can still whole-heartedly recommend it, but my gut feeling is that it's probably the next album which will be the truly definitive one as far as Autumn's definition of 'Acoustic Doom' is concerned.